When it comes to garage doors, there’s no other company to trust but ours. 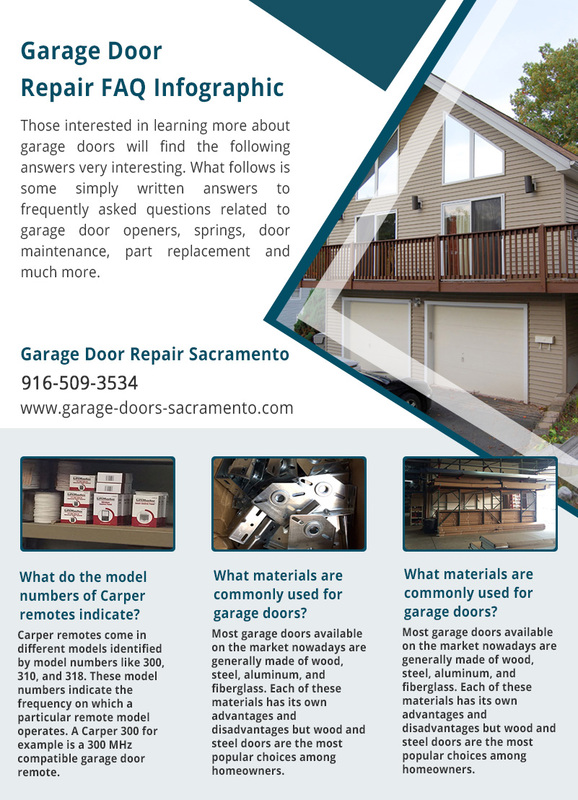 We at Garage Door Repair Sacramento have been in the industry for a long time. We don’t just have the experience, but the skills and the right attitude as well. Our dedication to our work and professionalism are what make us the go to service provider for our clients’ garage door needs and concerns. The excellent services of garage door repair guarantee safety. Your garage system will be fully functional thanks to our meticulous maintenance and repairs. We're trained professionals and carry the best tools in California. We're available for all services and promise efficiency. More and more garage door companies are being created, offering their service to customers. We’re happy and proud to say that our customers still chose to stick with us. Our long time clients know the quality of service we provide, which is why they recommend us to others. Our continuously growing number of satisfied clients is a proof that you can depend on us for your overhead door issues. Whether you need garage door spring replacement or you need help realigning your door, we at Garage Door Repair Sacramento will be more than glad to serve you. We understand that problems with garage doors could happen anytime. This is why we make sure that we have technicians ready to rush to your place and have the concern resolved anytime of the day or night. We operate 7 days a week so you can be sure that you can always call a professional in case you encounter any type of problems with your door. All of our technicians are skilled and experienced, working on all kinds and brands of doors including Genie, Liftmaster and Chamberlain. We have the most advanced tools to do the work fast and perfectly. For worn out and broken garage door parts that are better of being replaced, we carry top quality replacement parts from the best brands in the market. We aim to provide unparalleled service to our clients. Our focus is what’s always best for you. We want to resolve your concern without putting a hole in your pocket. Our service cost is always fair. We never overcharge as our objective is not just to work for a one time project, but to build a relationship with our customers. Our company is here to serve you. We have friendly, courteous and helpful staff ready to answer your queries and resolve your problem. Aside from fixing door concerns, we also offer installation and maintenance services. Send us an e-mail or contact us by phone anytime if you need our expert assistance.